INDUSTRY.co.id - Jakarta-Meeting accompanied by coffee break is usual. What if the break from meeting is treated to flash mob action? Definitely exciting. And this is at Best Western Premier The Hive. 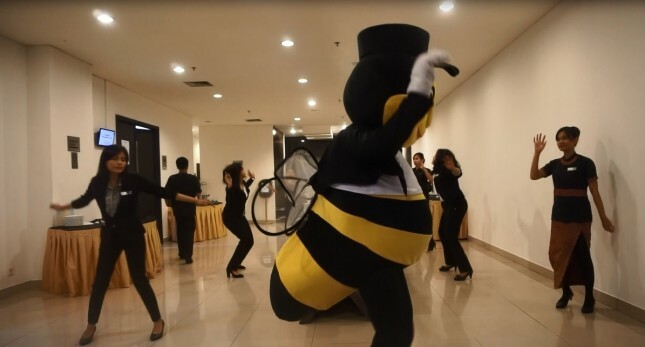 Guests who were breaking from the meeting entertained the flash mob from the back office team and the hotel operations located in the Cawang area. Marketing Communications Adriantomo says the flash mob starts as of July 2017. This is done to provide a different atmosphere for guests in the lobby or who are using the meeting room. Especially time in the afternoon is needed something fresh and spirit. Flash mob is also expected to evoke the spirit of the guests, proved to have guests who joined the dance. By wearing work uniforms, the employees do flash mob action with a duration of about 5 minutes, enough to give a different atmosphere. Adriantomo admitted this way got a good response from the guests who attended. Beside watching a short dance, the music that stomped also able to pass the spirit. Adriantomo added, it also not rarely create unique activities in front of guests, such as stand up comedy, magic show and others. "Everything must be different and unique to always be remembered," he said.